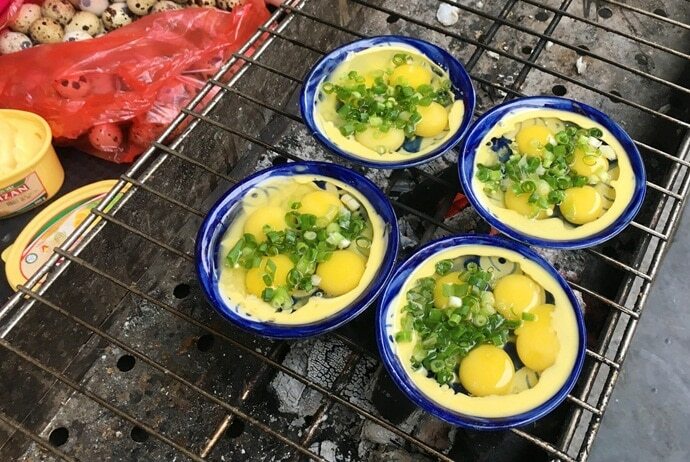 Grilled quail eggs are favored by young people and are one of the best snacks that tourists really should try out once when coming to Hanoi. The colorful, soft appearance, the great fragrance and the fatty taste of this dish will make you feel unforgetable! Now, we will show you the basic knowledge of grilled quail eggs, the ingredients and the ways on how to make this dish. 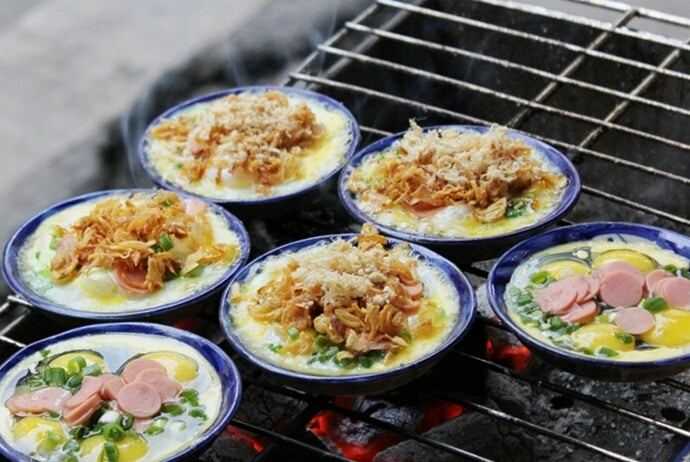 Besides, we will also expose some of the best places where you can enjoy grilled quail eggs in Hanoi. Let’s start with VinaFood! This dish is made from quail eggs combined with some toppings, such as sausage. All of the ingredients are placed in a triangle mold with the butter at the bottom so that the cake is not sticky. The cake is well-baked, and tourists just need to add chili sauce and enjoy. Today, the grilled quail eggs may come back with the name ‘grilled quail eggs with cheese’. The main ingredient is still quail eggs, but this new dish does not use mold as the original one. Instead, it uses porcelain cup. In general, there are 4- 5 fresh quail eggs in each cup. Then, the cook will sprinkle some raw green onions on the cake before baking it on the red charcoal stove. When making these quail eggs, it is very important to watch the heat of the stove. If the temperature of stove is high, the quail eggs will be easy to burn. Quail eggs are only put in when the stove is smoldering, giving enough time to cook the inside of the eggs. The fatty taste of the cheese will be melted at the tip of the tongue. Besides, the aroma of dried onions and a little fat of cooked quail eggs are also so great. Slowly enjoy this dish while chatting with your friends and looking at bustling Hanoi streets. This is actually a great experience for any tourist coming to the capital of Vietnam. In Hanoi, there are some street vendors where sell grilled quail eggs. And now, we will show you some of these places where you can enjoy this unique dish. All of these restaurants are crowed with consumers, especially at weekends. So, if you want to enjoy the taste of grilled quail eggs, you should not skip any of these restaurants. The shop is located at the back of Hang Da market. If you do not find the way, just ask any of the people around you about the right direction. The shop does not have its own shop and consumers have to sit in the plastic chairs on the sidewalk. At peak time, you have to wait a bit longer, but the owner here is very enthusiastic. This stall has been opened since September 2016, after the trip of the owner to Da Nang. She accidentally ate a baked egg dish at a small restaurant. She liked this dish so much and wanted to bring it back to Hanoi. 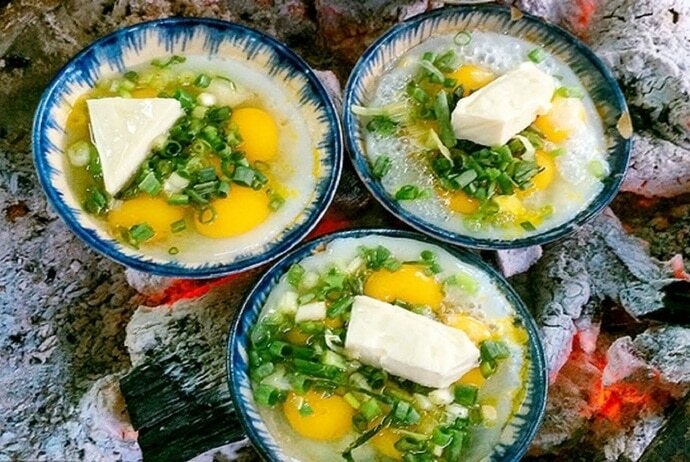 Unlike the grilled style in Da Nang, grilled quail eggs here have more butter in order to create attractive taste when cooked. After the cheese is spread on the plate, the owner places four quail eggs, spring onions, sausage and then grill a little more. At the same time, while the quail eggs are ripe, she will add other toppings such as dried onions, spring onions, cheese, etc. It may take time to grill, so you need to be patient to enjoy this dish. Grilled quail eggs are eaten with tamarind sauce that has sour and sweet tastes. If the tamarind sauce is better, it will make the food becomes perfect. The fatty smell of the quail eggs and butter, the aroma from the dried onions, mixed with the sweet and sour taste of tamarind sauce, all of which create a special flavor. The price for a cup of grilled quail egg is 10,000 VND and this is a reasonable price for this snack. The stall is open from 4p.m daily. If the weather is hot, it can open a bit later. On cooler days, consumers will be more crowded. 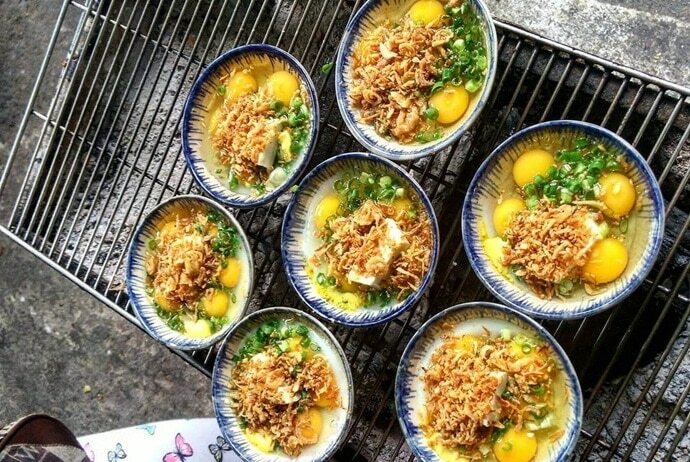 When it comes to finding a street vendor where sells grilled quail eggs, you should not skip this restaurant at Back Khoa campus. Just be a winter afternoon snack, but the flavors of quail eggs combined with dried beef and mayonnaise make this dish more special than anything else. First, the owner of the stall puts the pan on the charcoal stove and places six quail eggs. Next, she sprinkles with corn, a little green onion and dried beef on top. Then, she covers the eggs and waits for 3-4 minutes before opening the lid. She sprinkles the tomato sauce, chili sauce and mayonnaise over the pan. Actually, the quail eggs with dried beef are really delicious. 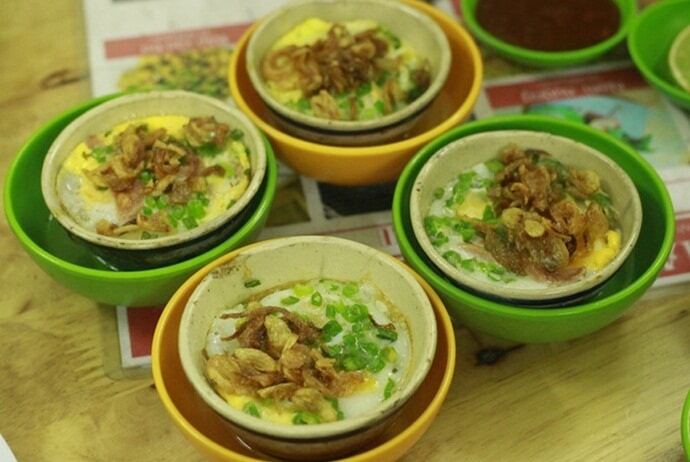 The taste of quail eggs mixed with corn, dried beef and dipping sauce makes this dish so fascinating. Apart from grilled quail eggs, you can try “bánh tráng nướng” and “bánh tráng cuốn” at this stall. “Bánh tráng nướng” has a layer of egg on top of the rice paper, making it different from other baked goods in Hanoi. “Bánh tráng cuốn” is normal. The tamarind sauce is not too bad, but due to the combination of rice paper rolls, it does not blend the taste. With attractive look and great flavor, grilled quail eggs have recently become the favorite snack of young people. Quail eggs here should be eaten hot with a little chili sauce, dried beef and butter. However, there are a few disadvantages of this stall. First is that it is a little hard to find the way and second is this dish is not really clean. Actually, it is a street food, so the taste can be delicious, the price can be affordable, but the quality of hygiene cannot guarantee. Learn More: Vietnamese Glutinous Rice Doughnut – Banh Ran – Where to Enjoy? The grilled quail eggs are mixed with butter and dried onions to create the flavors that many young people love, especially in cold weather. To add extra flavor, you can add the dipping sauce to the egg and then enjoy. The sauce is a combination of ripe tamarind, sugar, salt, onions, fish sauce, and chili sauce, creating a great addition to grilled quail eggs. Actually, if you are looking for a restaurant where you can enjoy grilled quail eggs, you can consider visiting this street vendor on Cau Go Street. 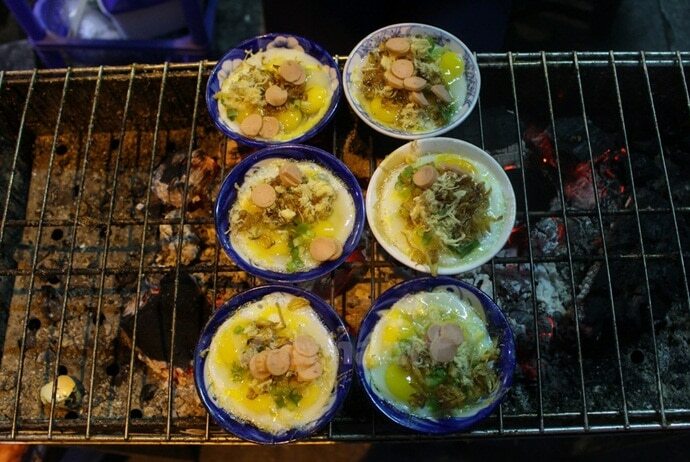 In Hanoi, there are some street vendors where sell grilled quail eggs that are favored by many young people. So, if you have a chance to visit Hanoi, or if you want to enjoy the unique taste of this dish, you should try visiting any of these restaurants as mentioned above. And certainly, you will never regret about your choice.